During the colonial period, the arrival of sugar culture deeply impacted the society and economy in the Caribbean. It not only dramatically increased the ratio of slaves to free men, but it increased the average size of slave plantations. Early sugar plantations made extensive use of slaves because sugar was considered a cash crop that exhibited economies of scale in cultivation; it was most efficiently grown on large plantations with many workers. Slaves from Africa were imported and made to work on the plantations. For example, prior to 1650 more than three-quarters of the islands’ population were white. In 1680, the median size of a plantation in Barbados had increased to about 60 slaves. Over the decades, the sugar plantations became expanding as the transatlantic trade continued to prosper. In 1832, the median-size plantation in Jamaica had about 150 slaves, and nearly one of every four bondsmen lived on units that had at least 250 slaves. For about 100 years, Barbados remained the richest of all the European colonies in the Caribbean. 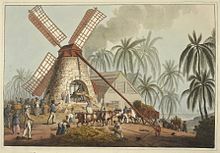 The colony’s prosperity remained regionally unmatched until sugar cane production expanded in larger countries, such as Saint Domingue and Jamaica. As part of the mass sugar industry, sugar cane processing gave rise to related commodities such as rum, molasses, and falernum. In the 19th century, sugar dominated Martinique, Grenada, Jamaica, Saint Croix, Barbados, Leeward Islands, Saint Domingue, Cuba, and many other islands that had been run by French, British, or Spanish owners. During the late 19th and 20th centuries, the sugar cane industry came to dominate Puerto Rico‘s economy, both under the colonial rule of Spain and under the United States. Although these nations have taken measures to mitigate the impacts of the sugar revolution, in some there are still traces of what the environmental historian of the Caribbean and Latin America, Reinaldo Funes Monzote, describes as a “serious deterioration” of the natural environment, with socio-economic consequences. Marshall, RO; Kooi, ER (April 1957). “Enzymatic conversion of D-glucose to D-fructose”. Science. 125 (3249): 648–9. doi:10.1126/science.125.3249.648. PMID 13421660. Samuel, VT (February 2011). “Fructose induced lipogenesis: from sugar to fat to insulin resistance”. Trends Endocrinol Metab. 22 (2): 60–65. doi:10.1016/j.tem.2010.10.003. PMID 21067942. Watts, Sheldon J (April 2001). “Yellow Fever Immunities in West Africa and the Americas in the Age of Slavery and Beyond: A Reappraisal”. Journal of Social History. 34 (4): 955–967. doi:10.1353/jsh.2001.0071. ^ “The Sugar Trade in the West Indies and Brazil Between 1492 and 1700 · University of Minnesota Libraries”. www.lib.umn.edu. Retrieved 2018-05-27. ^ Draper, Mary (2017-11-01). “Timbering and Turtling: The Maritime Hinterlands of Early Modern British Caribbean Cities”. Early American Studies: An Interdisciplinary Journal. 15 (4): 769–800. doi:10.1353/eam.2017.0028. ISSN 1559-0895. ^ Gerardo E. Alvarado León (September 2, 2018). “El Caribe comparte los impactos causados por industrias azucarera y ganadera” (in Spanish). El Nuevo Día. Retrieved September 4, 2018.